File got lost from SanDisk SD card? Are you looking for an effective way to recover lost data from SanDisk memory card? This tutorial is going to help you with SanDisk memory card data recovery issue. Profession SanDisk recovery software is available here to help you get back deleted or lost data from SanDisk memory cards quickly and safely. Is it possible to recover files from SanDisk memory card? Technology makes this digital life easy and convenient. Nowadays we are able to put very large amount of data to a tiny storage device such as USB flash drive and memory card and take them to anywhere we want. SanDisk is one of the manufacturers which produces and sells all types of USB drives and memory cards. SanDisk, founded in 1988, is one of the well-known manufacturers of flash memory products such as memory cards, USB flash drives and SSD. SanDisk memory card includes SD card, CF (CompactFlash) card, XD card, etc. and they are usually offered with an excellent price to performance ratio. SanDisk memory card is preferred by both professional and regular users who use memory cards on digital camera, smart phone, vehicle navigation, etc. As a SanDisk memory card user, you may also need to face data loss due to many reasons. When data loss issue appears, don't be panic. No matter what causes of the issue, there is a chance that you can perform SanDisk recovery from memory card as long as lost files are not overwritten and there is no physical damage on the card. In general, when files got lost from SanDisk memory card, they are not erased immediately. If you protect lost data against data overwrite, you can recover files easily with a reliable recovery program. Accidental deletion: unintentional deletion of files is one of the major causes of memory card data loss issue. Some users delete files for the purpose of free up disk space on SanDisk memory card and delete file by mistake. Since memory card is removable storage device, deleted files won't be put into Recycle Bin. Therefore users cannot restore them directly. Improper operation: There are many operations are not proper, but they are not recognized by many users. For example, you may pull out SD card without turn off digital camera; remove memory card from computer without clicking Safely Removal Hardware. File system corruption: File system on the SanDisk card becomes corrupts and becomes RAW. When you try to access it, you receive error messages such as "You need to format the disk in drive before you can use. Do you want to format it" or "The file or directory is corrupted and unreadable". Corrupted memory card is no longer accessible and you lose files on the drive. Virus attack: Virus and malware is destructive program which is also data killer. Virus is able to infect various storage devices and cause data loss issue. Bad sectors: Sectors which cannot be read or written are called bad sectors. If the memory card contains lots of bad sectors, you'll lose files that are stored on bad sectors. Other reasons: There are several other causes of the issue such as unexpected power off, physical damage, system crash, USB not working, etc. You may wonder if it is possible to recover files from SanDisk memory card. The answer is yes, you can perform data recovery on almost all storage devices as long as lost files are not overwritten. In most cases, deleted data still stays on memory card even though it cannot be seen or accessed by operating system. As to RAW drive, files are also not gone for good, you have chance to retrieve data from corrupt drive with correct recovery software. To recover lost or deleted files from SanDisk memory card, you should scan it using data SanDisk data recovery software which is designed to scan storage device and get back lost files from all kinds of devices. However, the precondition of memory card recovery is that lost files are not damaged or overwritten. That's because recovery software recovers files via read-only manner and it cannot repair damaged files or restore overwritten data. If you want to do SanDisk data recovery, a data recovery tool is needed. 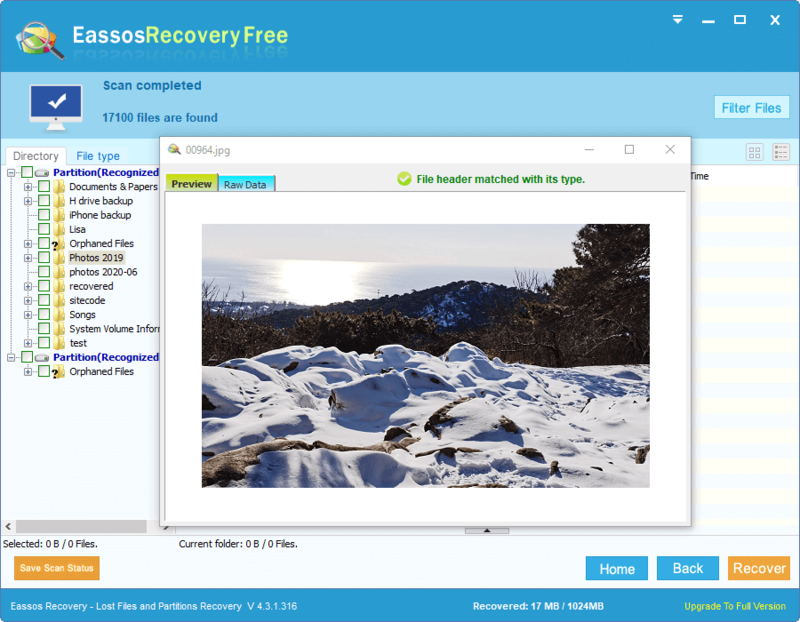 You can run Eassos data recovery software to restore deleted or lost files from all kinds of memory cards, flash drive, hard disk, external hard drive, virtual disk, etc. 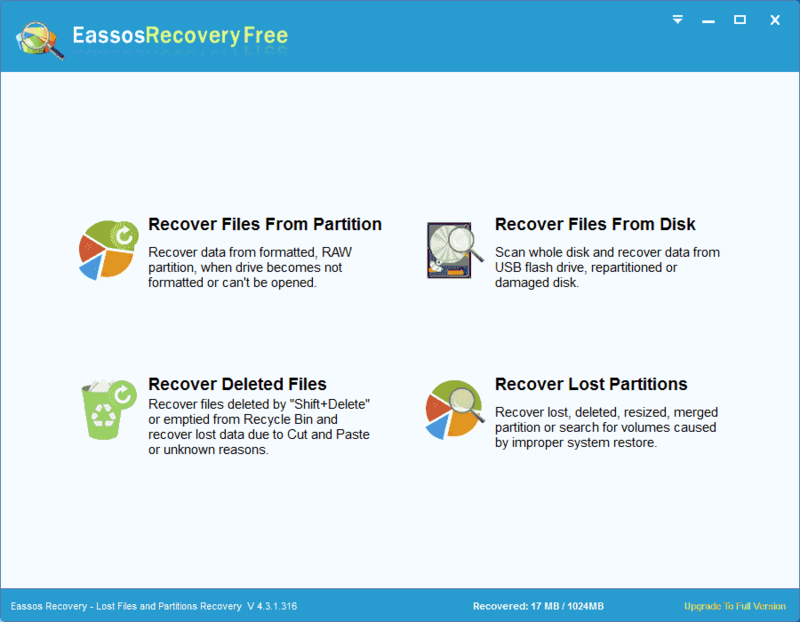 Eassos Recovery Free is a simple but effective data recovery tool for SanDisk SD card data recovery. This freeware uses a wizard interface to recover data and users can follow the onscreen steps to easily recover all lost data from any storage devices. 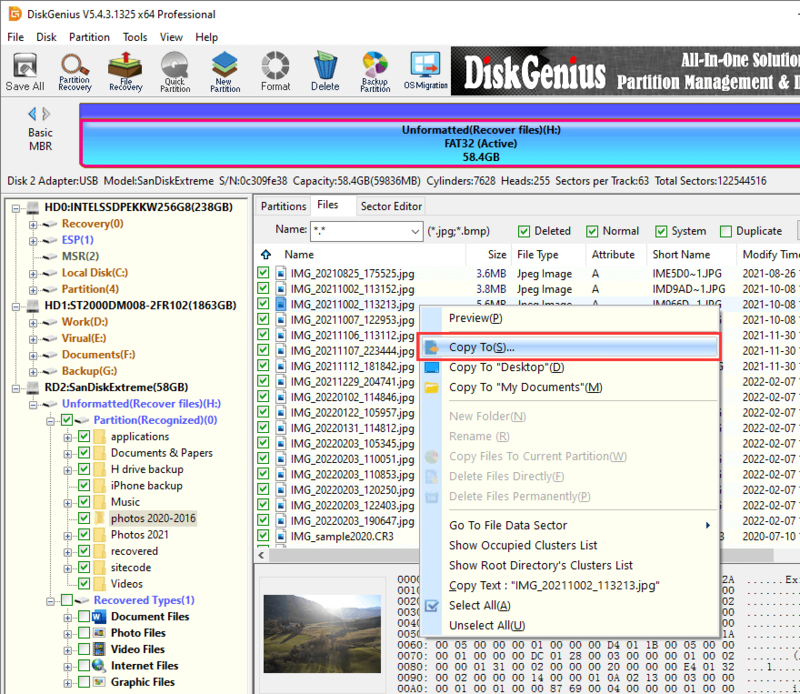 DiskGenius is powerful and advanced data recovery software which users advanced recovery algorithm to search for lost data. It supports recovering lost data from SanDisk memory cards with FAT, exFAT, NTFS, Extr2, Ext3 and Ext4 file systems. With correct SanDisk recovery software you can recovery lost photos, video, audio and other files which get lost due to deletion, formatting, or other unknown reasons. The recovery process is very simple and does not require any professional actions. In this section, we'll show you how to recover deleted files from SanDisk SD card using free SD card recovery software. Step 1 Connect the SanDisk SD card to computer. You can connect SD card to computer via a card reader or directly connect camera without taking out the card. You should make sure the SD card can be recognized by your PC, which means you can see its drive letter in File Explorer or Disk Management. Step 2 Launch Eassos Recovery Free and select correct recovery mode. 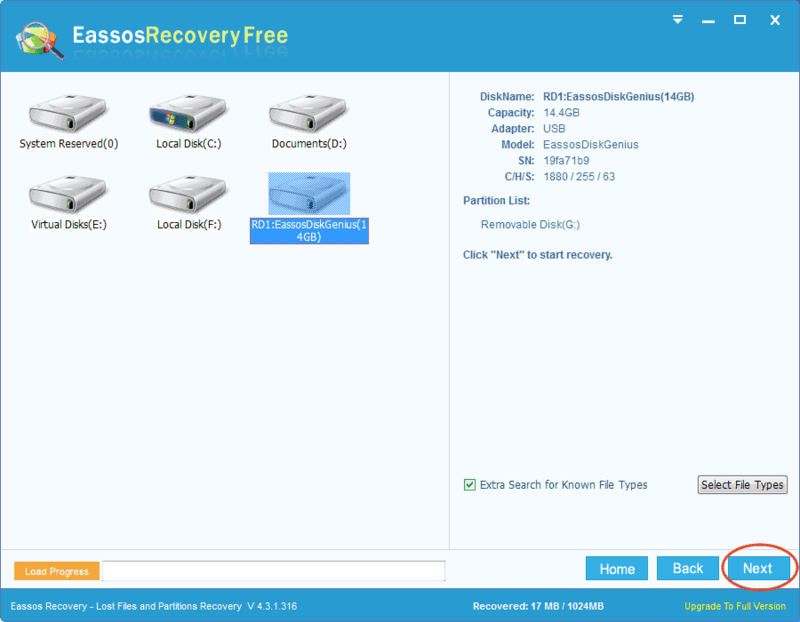 There are four recovery options on the main interface, and each option is able to deal with a series of data loss issue. For example, to undelete files from SD card, the "Recover Deleted Files" option should be selected. Step 3 Select the SanDisk SD card and click Next to search for deleted files from the memory card. You can see all drives on your computer in this interface, and you need to choose the memory card where lost files were located. If you choose wrong drive, the application cannot find out correct files for you. Step 4 Preview recoverable files. You can click Preview to open the file in previewing window and check file content in original size. File previewing helps to decide if the file is correct or damaged. Hence, you can make sure whether your files can be recovered successfully before actual recovery. Step 5 Copy files to a different drive. Choose files and folders you want to recover and click Recover button, and you can set a location which is different from the memory card to save files. Note: when you recover data, do not forget check files listed under File type tab. Files displayed under this category is the result of deep scanning, which may contain files that are not listed under Directory. This guide introduces how to recover lost data from inaccessible, corrupted and RAW SanDisk memory card with the help of professional data recovery software DiskGenius. You can use the trial version first to test if your files are recoverable. Step 1 Connect the corrupted SanDisk memory card to computer and make sure it can be recognized by Windows. 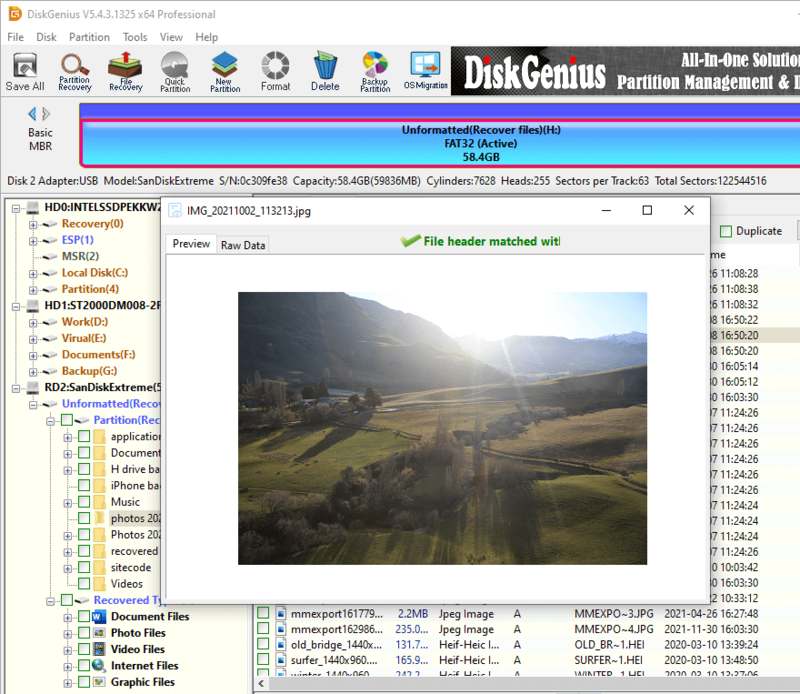 Install and launch DiskGenius from your computer, and you can see the memory card in the software. Step 2 Select the corrupt memory card and click "File Recovery" button from the toolbar. Then you can see following window pop up. Step 3 Select "Complete Recovery" and "Search for Known File Types"and click Start button. 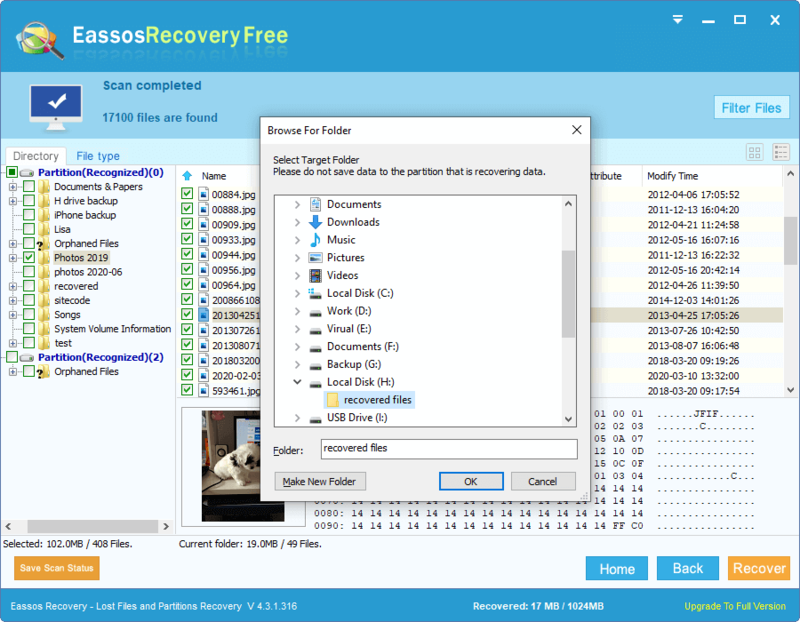 Complete Recovery option scans the entire memory card to locate recoverable files with original names and paths; "Search for Known File Types" searches file by file types, which does not consider file directory, as file directory may have been destroyed when the memory card got corrupted. This option does a deep scanning and finds out more recoverable files. Step 4 Preview files after scanning. You can preview files displayed in scanning result and check if these files are correct. Step 5 Recover data from memory card. Choose files and folders you want to restore from the corrupted SD card, and save them to computer by selecting "Copy To" option from context menu. Here are some tips you should pay attention to so that you can achieve a successful SanDisk memory card data recovery. Avoid data overwriting: the first thing you should do is stopping using the SanDisk memory card immediately when you sensed data loss issue. If you continue taking photos or saving data to the memory card, you are likely to overwrite and destroy lost files and cause files unrecoverable. Do not format memory card: If your SanDisk memory card gets corrupt, it may become RAW file system and inaccessible. Besides, you'll get error messages when attempting to open it, for example, Windows asks to format it before you can use it. In such situation, you should close the message box and do not format the memory card. Do not run Chkdsk: although many technical guides recommend to run chkdsk command to fix corrupt file system, you should not try those solutions if the corrupt partition contains very important data. This repairing process is likely to over-repair file system and damage original directory structure, which means you are probably not able to recover lost files with original names and paths. Choose appropriate data recovery software: A suitable SanDisk recovery program should be easy-to-use, efficient and reliable. To get better recovery result, you can try different programs and choose the one that works best on your case. As mentioned above, you can easily carry out SanDisk data recovery on your own with the help of either free data recovery software or professional SanDisk recovery software. One thing should be noted that overwritten or damaged files cannot be recovered successfully, thus you should prevent any writing actions after data loss so that you can achieve successful recovery. If you feel this guide useful, please feel free to share it.